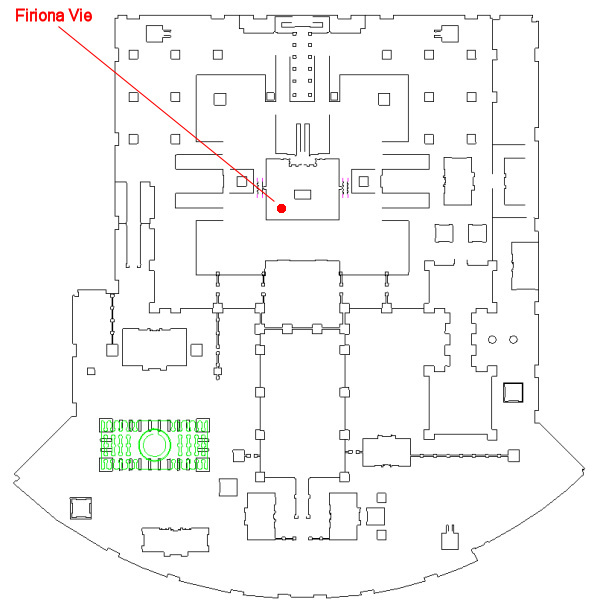 This group mission begins with Firiona Vie (click for map image) in Katta Castrum: Deluge. She's found in the southwestern part of the temple's main floor. Say "Tsaph" to request the mission and "ready" to zone in. Firiona Vie frowns and nods as you speak Ognit's phrase to her and tell what happened on the island of storms. 'Ognit is safe then? Safer certainly than we shall be. That [beam] of light he saw: It did not fall harmlessly into the sea. Firiona Vie sighs. 'I languished in the chambers of my father's house, as I admit I am wont to do in times of grief. How I have failed Norrath in my absence! I could not face my father or [Tunare]. When at last I had the courage to enter the Plane of Growth and see my father, Galeth, who had thought I was dead and who had long since abandoned his mortal form...' Firiona trails off and wipes a tear from her eye. You have been assigned the task 'The Edge of Balance'. Now that the dome has been stabilized, Firiona wants to check on Tsaph and make sure nothing has happened to him. She is worried about what this attack will mean for her mission in the Buried Sea. Hail her until the task updates. Just outside the temple, several members of the Combine attack Tactician Sodut and company. The "a combine _____" mobs hit for a max ~13,000 and are immune to stuns, but are mezzable and rootable/snareable. They are NOT aggro-linked. You may want to invis up before moving back in (or move quickly). Once you step inside the temple, five more "a combine _____" mobs spawn at the doorway. Hail him until the task updates, at which point (shortly after) the two brutes become auto-aggro. The brutes, by this time, have moved to the portal in the northwestern corner of the zone-in room. These two are stunnable, mezzable, and rootable/snareable. They might be aggro-linked. Each hits for a max ~16,000 and summons when damaged. Enter the portal, and you'll find yourself in Tsaph Katta's resting chamber alongside Firiona Vie. Hail Una Lucem, and be ready for a fight. Firiona Vie rushes to aid the head attendant. 'Haestus, look out! Don't let her...' Firiona's voice catches as Una Lucem envelops her in magic. Her eyes entreat you to stop Una Lucem. DPS her to 10%, at which point she goes non-aggro. Una Lucem says, 'You are strange.' She waves her hand, and you feel magic gripping you. Una Lucem's sword flicks out like a snake's tongue, swift and silent. Haestus' belly sags and begins to spill its contents. 'It's more colorful than his robe.' Una watches the man dying on the floor. Firiona Vie's eyes seethe with anger, though her mouth cannot voice it while Una's magic holds her. Lanys T`Vyl laughs. 'Do you see this, Firiona? Once again you lose your purpose in this world: your cause and your Lifeguide. But don't fret; I have plans for you and your companions. Perhaps you will find there are more important things to fight for than balance. Hail her to complete the task. A chest also spawns at this time. The task is repeatable with a 6-hour lockout timer from the time of request. The 5-packs of mobs can be rooted, snared, mezzed and they do succumb to druid Nature's Serenity ("calm"). They do spawn closely together so be prepared to get twosies, even if you calm them. My enchanter is only 101 at the time so her top aoe mez (caps at 103) didn't always land on all the mobs. I had to use Bewilder (108 cap, single target) to control the higher mobs. Yeah, I suffered a few deaths learning the mission but could repeat it now death-free easily. The boss sees thru invis, but again the fight doesn't start till you hail her. We saw her cast Shock of Magic on a groupmember other than the tank just once. At least for me on 12/28/2014 I only had to hail him 4 times before the brutalis fight and not 7. In your write-up it says the two Brutalis are immune to stun, but I am a 102 Paladin and I was stunning them just fine. Chest spawned today after final step. You wont actually defeat her as her patron cheats(Dev's Pet!). About the time you beat her down to 10% you get hammered with an unresistable spell that prevents you from casting or fighting. (Time to stop and do dialog).You cannot cast from this point on so no rezzing anyone that has died, but there is a long enough period of talk and all the hails so can probably run back to be sure you get credit for the mission if you died. She hits like a truck so if she gets away from tank or your healing is lacking she can pound your group .